The Boys’ Tops Are Done! I can check the boys’ tops off the list! The process went smoothly, which is a benefit of my 3+ years of purging coupled with�judicious clothes shopping. I not sure how this would have gone had I taken on the KonMari method of tidying up pre-The William Morris Project. I know, that sounds discouraging and pessimistic to say to people eager to jump in and experience�the “life-changing magic” of tidying up. Think about it:�Kondo wants us to get rid of everything that doesn’t “spark joy” and learn a new way (the “right” way) of folding and storing clothing. She’s asking a lot, especially when she admits this process took her years of trial and error to develop. Most adults know how to walk, but a toddler�doesn’t. A toddler’s ability to walk adeptly builds upon the initial stumbles and missteps. The learning process is priceless and ongoing. I’m proof of that. After three years of getting rid of�possessions and clutter I still had to buy Kondo’s book twice because I lost the first one in a purse I forgot to empty, and only�found the purse and book while moving furniture for another reason! It’s risky to�discredit the need for�trial and error when�figuring out what works in your�home. I can’t count the number of times I’ve purged my closet or rearranged my drawers, but I can say that each time I’ve done it the process is easier and faster. To claim this is the one true way and that no one relapses is bold. Possibly disingenuous. Definitely�stupid. I put all the boys’ tops on the bed in the guest bedroom. If you follow me on Instagram, this picture looks familiar. I may be delusional, but I think that’s a reasonable amount of tops for two boys. Ok, reasonable may be a stretch. The pile is better described as your typical, middle-class excess. Here is the same pile folded, post-purge. I got rid of very little. The broadcloth, collared shirts are hanging in the closet. No pictures of those today because the closet is a disaster. Now there is an area that I have cleaned, purged, and reorganized over and over again. I’m still looking for the magic configuration! Which brings me to the subject of Kondo’s folding method. At first, I grumbled. It took me a while, but I quickly picked it up and was folding “properly” by the 5th t-shirt. 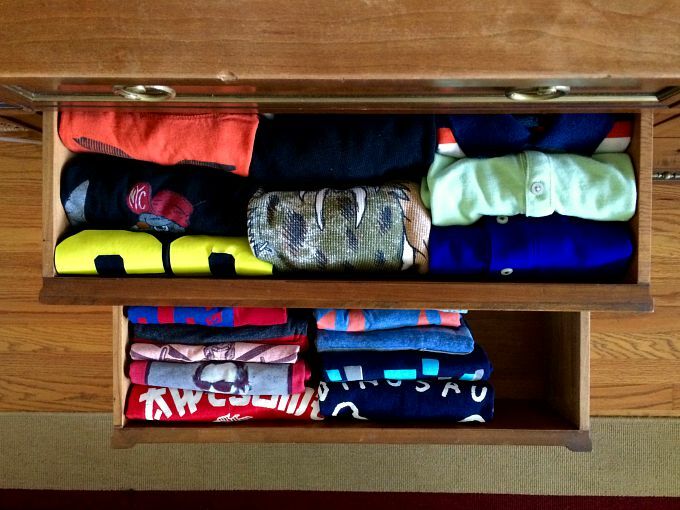 I had to adapt the method with more folds�so that the t-shirts fit in the shallower vintage dresser drawers. 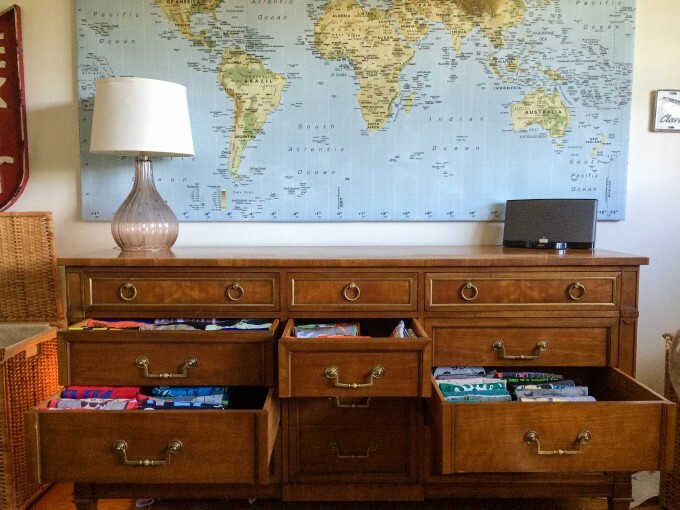 There is no doubt about it: the drawers look great. Kondo’s folding method is space efficient, too. Before, their drawers were fit to busting. Now, there is plenty of room for more t-shirts (they’re not getting more t-shirts). You can see most of the t-shirts at a glance. You can’t see the�t-shirts at the very back of the drawer�unless you pull the drawer all the way out, so our t-shirts fill the first 3/4 of the drawer. We’re still left with�more space than we had before so it’s worth filing them rather than laying them flat. How long the t-shirts stay looking pretty and organized remains to be seen. I give it four days. Only empty houses stay perfectly clean and organized. I’m not fooled into thinking the boys are going to tip-toe through their t-shirts so they remain pristine. They’ll get messed up and the system may fail. I refuse to beat myself up over calamitous dresser drawers. Kids are kids, life happens. Those drawers look great! The folding of clothes is the only tip I took from the book and only did my drawers. They aren’t looking as good as yours, but I did not perfect the folding technique. I highly recommend this approach even if no other suggestion is taken from her. You can see the excess in your clothing , like who needs five white camis, and I found out I wear the same stuff over and over and some little bundles are never touched. Brilliant revelation that can lead to more purging. I need to get the book out again, but it is soooo brutal in its method . . . Baby steps are better than no steps, I say. 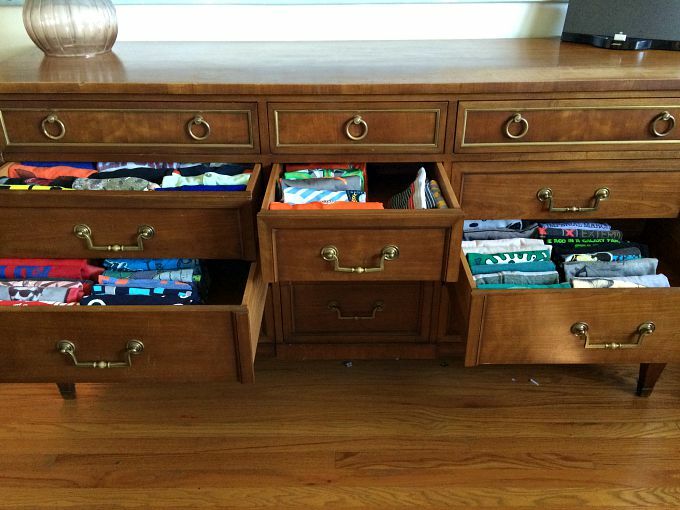 Again, those drawers rock! I agree with everything you said. This is definitely how I will fold my shirts moving forward for my own clothing. When I have my seven year old son put his clothes away, he pays no attention to filing them. But, I’m ok with that. I will be interested to see how you like her sock method. that has not worked well for my son. So, I ball them up. Otherwise they get separated and mixed up. I am glad you are going through this book because it is reminding me of all that I have forgotten since I first read it. I probably blocked some of it out, because I felt overwhelmed. 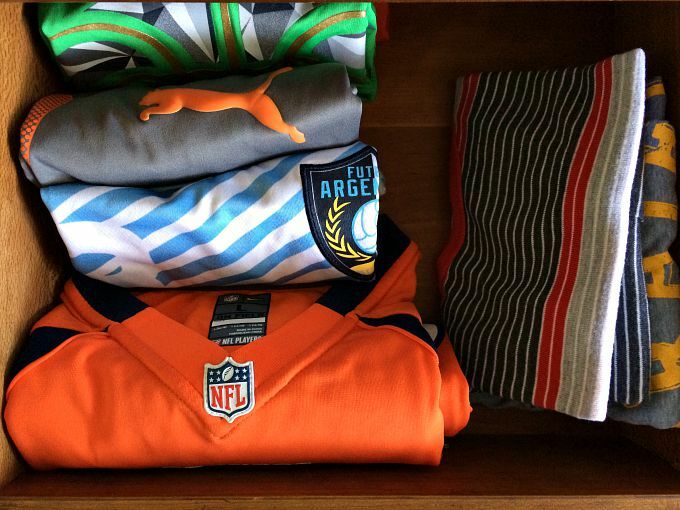 The boys like how the drawers look, and so far Nico has taken care with his shirts. He says he likes how he can see everything at a glance, whereas before he had to hunt and gather, which resulted in a big mess. I want my older boys to do their own laundry…at least the folding and putting away. So, as nice as that looks, I’m not thinking they’ll take the time to fold that way, though it’d be nice vs. the “just throw it in there” method they keep using, no matter how many times I show them other ways!!!! Mikey and Nico know how to fold their laundry (Gap fold) and they do it when asked. We don’t often ask because it takes them forever and we get impatient. I’m looking into a t-shirt folder. It’s something I would never buy–still may not–but I’m thinking it may make the folding process go faster for them. After being stuck in the house with sick kids all week I tackled my husbands closet drawers with this method, mostly because he has a lot of tshirts and it would be good folding practice. I love the way it looks finished but wonder how maintainable it will be. Its easier to see the shirt he wants but I can see that laundry day will require a lot more hands on work going forward. 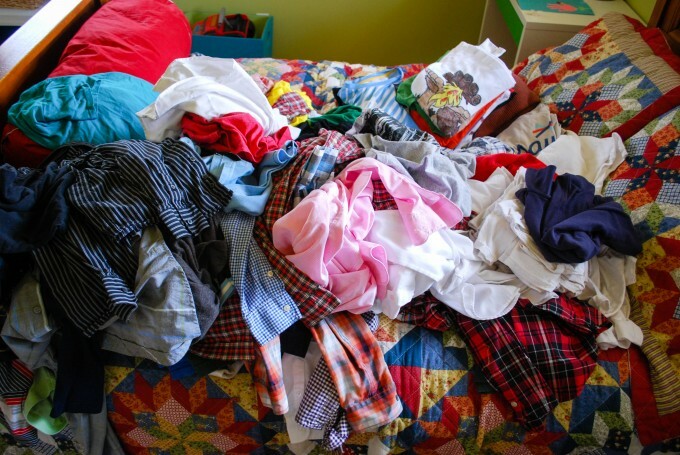 I suppose that is meant to be countered with less laundry to fold……. I also am not sure how to incorporate this with my kids’ laundry. I’m trying to teach them to participate in their own process and putting away just got a whole lot more complicated if I use this method. Have you come across any interesting/useful reads on it? I know that she is expecting her first child soon and it will be interesting to see if that changes her methods at all. I haven’t found any tips for KonMari kids, but I’ll keep looking. I’m curious to know how manageable it is when left to a child’s devices. I’m sure the drawers don’t look as pristine. I have said I’d never fold the shirts that way, but now that I’ve seen yours….Maybe. Because those look so neat and tidy, and I was cursing the jumble in my t-shirt drawer just last night. My drawers, which I’m working on today, are a sight. Not a good sight. When I listened to the book (audio version) I thought it was weird how the method was so general and there was so little as far as detailed instruction on how to go about it. Yet so specific and focused on a FOLDING METHOD of all things. It didn’t make sense to me that the only thing she’s really telling me how to do is fold. I thought, tell me how to deal with this mess that is my kitchen besides just looking for “joy” being sparked. I don’t need to know how to fold; I already know how to fold. Then I tried the folding and it was pretty amazing. Something about seeing all the clothes lined up and ready to go has been really inspiring for me. I, too, am uncertain about maintenance, but at least as a starting point I’ve been really surprised how much of a difference her folding method has made. I look forward to seeing the “after” picture in a month or so. Not that I’m being pessimistic or anything, but Grace would pull out one shirt and somehow all 4 drawers would look like mini-tornadoes hit them. 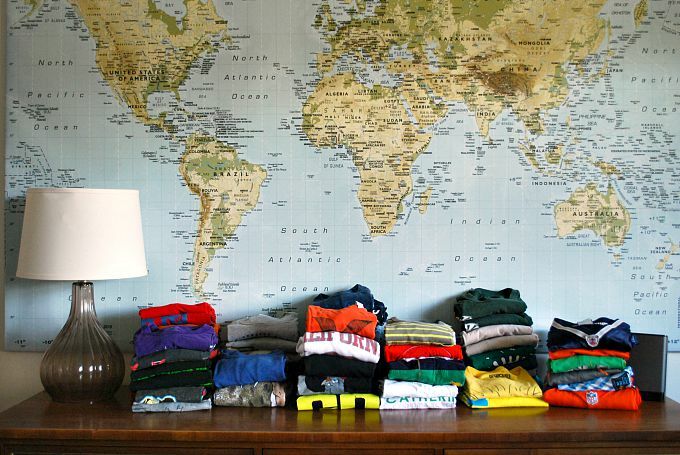 Just by looking at these neatly folded shirts I feel relaxed. My home definitely would need a thorough purging and organizing. I’ve been putting it off for far too long now. It’s just so hard to get going and keep going. I really admire how focused you are. I could see doing this for Violet seeing that she often refolds her clothes when putting them away (you do it too messy, mom) and her drawers are often neater than mine but no way this would work for Abram who hates putting away his own clothing away now. (It takes too long and is soooo boring, mom. – Because it’s a chuckle a minute for me). Annnnnyway, my need for a neat house falls below my need for kids that take responsibility for their possessions. My two are a smidge younger though too. I laughed when I read her section on socks. Folded shirts and kids are one thing. Socks are completely different. If I don’t turn the top of one over the other, they don’t stay together. Kids don’t look through their things like adults do. Socks separate from their mates and then no one can find the matching sock. I’m trying to decide if I want to tackle the KonMari method. Love the folding. Used it for a two week vacation and my stress level dropped remarkably. Very zen. I fold and file and I love it. I file it so that I can see the back half of the drawer as well, (so the shirts are filed perpendicular to your drawer instead of parallel). My aunts even do this for their underwear and makeup.